Posted May 18, 2018 by Eds. The year 2018 marks the bicentenary of Karl Marx, a philosopher and thinker who is partially understood without being read by his critics. Marx doesn’t lack vocal critics but in my opinion, it is the need of the hour to argue how Marx helps us understands Indian society and what lies ahead. In a nation like India, the vision of Karl Marx has enough relevance due to deep-rooted class and caste discrimination. His renowned work with Friedrich Engels is on the contradictions of capitalism. Capitalism’s profit-making tendency eats up surplus labour and makes overproduction inevitable. This means capitalism keeps facing recurring crises. Marx read history through the lens of class struggle. ‘Class’ in Marxism is determined by one’s relation to the means of production. Marx didn’t invent the idea of socialism – there were socialists before Marx. However, Marx and Engels did come up with ‘scientific socialism’, in contrast to the ‘utopian socialism’ that had existed before. Marx is often blamed for the death of millions under communist regimes such as Stalin’s Russia or Cambodia under Pol Pot. However, it seems rather unfair to blame a philosopher for the poor implementation of his ideas, especially when political killings are not even mentioned once in his writings. 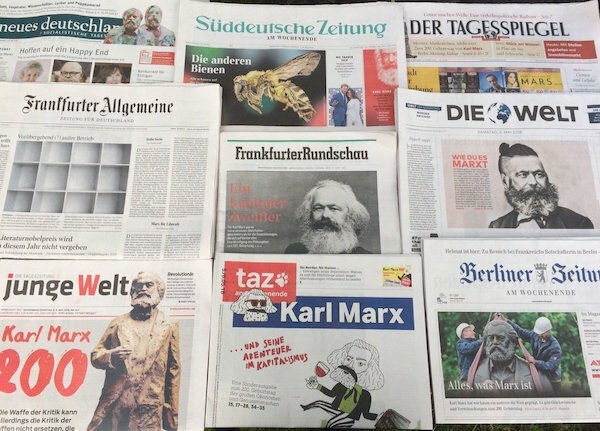 It has been nearly three decades since the fall of the Soviet Union and blaming Marx for the totalitarian character of these regimes is unfair. Marx and Engels’ vision of a communist society is a far cry from such totalitarian horror. Revolutionary terror may be used during the revolution but to make it a permanent state of affairs even after the revolution was never an idea proposed by Marx or Engels. There are ideologues, social theorists and political leaders in India who reject Marx’s theory based on incomplete knowledge, just like people elsewhere in the world. Indian opponents of Marx have two types of opinions on Marx’s theory – 1) Marx’s theory was only relevant to 19th century Europe and circumstances today are a lot different; 2) Marx’s theory may be relevant to other countries but not in India because Marx never wrote about the caste system. But let us not forget Karl Marx was one of the first thinkers to draw sharp attention to the highly deleterious impact of caste on Indian society and its causal link with the relations of production. In his famous essay on “The Future Results of British Rule in India”, Karl Marx characterized the Indian castes as “the most decisive impediment to India’s progress and power”. Precisely in social terms, Marx argued that the caste system of India was based on the hereditary division of labour, which was inseparably linked with the unchanging technological base and subsistence economy of the Indian village community. He said that the economic system classifies labour into manual and mental. Mental labour possesses higher value and manual labour possesses lower value. The latter gains prominence and respect in any hierarchical system, while the former languishes at the bottom of the social structure. A society based on the exploitation of labour exploits manual labour most intensely, especially the bottommost manual labourers. For example – an engineer and a factory worker would have unimaginable differences in income, exploitation and livelihood. Majority of the upper caste population are engaged in mental labour and lower castes carry out manual labour. Marx did address this Indian issue, calling the caste-based communities “small and extremely ancient” in  “Capital”, but he does not give a concrete solution to the problem of caste. Today, there is labour unrest nationwide under the Modi government, jobless growth, skyrocketing unemployment, rapid unleashing of neoliberal policies which have created a colossal gap between different sections of society in terms of wealth. 73% of the nation’s wealth is in the hands of just the 1% ultra rich. Shouldn’t we realise that Karl Marx’s theory on contradiction and crisis of capitalism and remain most relevant for Indian democracy? Caste-based labour determination is an addition to Marx’s theory of labour. But is it not our responsibility to alter Marx’s theory according to the Indian context, where caste as identity is a decisive factor? If this is not done, it will be injustice to our own people. In political terms, India needs robust democratic welfarism which needs detail study led by an experiment. For the first time in India, an alliance between communists and Ambedkarites has happened. The Bahujan Left Front (BLF) is creating new political space for the downtrodden. This approach combines the understanding of both Marx and Ambedkar, as India never witnessed a revolution and Indian society is comprised of monopoly bourgeois and feudal relations. Marx’s theory of annihilation of class and Ambedkar’s theory of annihilation of caste need to be synthesized and put to immediate practice for the emancipation of the Indian populace. If the Indian Left formulates this understanding on a broader level just like the Nepali communists, some radical improvement could be brought about by combining Marxian welfarism with Ambedkarite socio-economic reform. In simple terms, this vision will be an extension of the annihilation of class combined with the annihilation of caste to form a classless-casteless society. Marx remains relevant because capitalism essentially is based on inequality of the worst order and socialism in Indian conditions can provide an answer to both the class and caste questions. We must not willingly accept a social order based on inequality of any kind. We must also understand that Marxist revolutionaries such as Lenin, Mao, Ho Chin Minh, Castro, etc. adapted ideas of Marx which suited best the needs of their revolutions. Indian conditions demand the same. Application of Marxian principles cannot be the same everywhere as Marxism or scientific socialism itself is a dynamic force which demands change in the application according to the place and condition. With this hope, let us look forward to realising Marx’s vision of a more equitable society.